New York Times bestselling and multiple Eisner-award winning writer Brian K. Vaughan (SAGA, PAPER GIRLS, PRIVATE EYE) and legendary storyboard artist Steve Skroce’s WESTAND ON GUARD’s jaw-dropping military thriller will be collected for the first time into a deluxe hardcover edition—which will include original sketches and other never-before-seen extras—available this May. 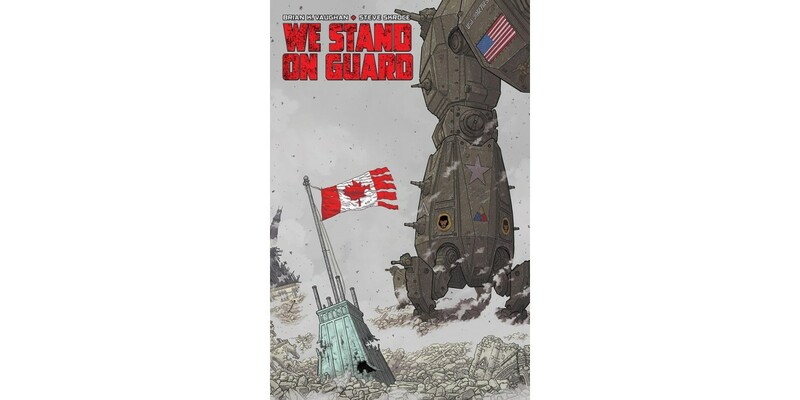 Set in a future where a heroic band of Canadian civilians must defend their homeland from invasion by the United States, WE STAND ON GUARD launched to critical acclaim and blends the episodic up-tempo pacing of Y the Last Man with an invasion story full of suspense and action. WE STAND ON GUARD Deluxe Hardcover (ISBN: 978-1-63215-702-7) collects the complete series, issues 1-6, and hits comic book stores on Wednesday, May 4th and bookstores onTuesday, May 10th, and will be available for $24.99. It can be ordered by retailers from Diamond Book Distributors with Diamond code FEB160645. It can be preordered now on Amazon, Barnes & Noble, Indiebound, and Indigo.